I went to bed on the 24th dreaming not of santa and reindeer, but instead limestone ledges and giant brown trout. My family was set to get in late on Christmas Day, so again, I loaded up the car and headed for the stream. 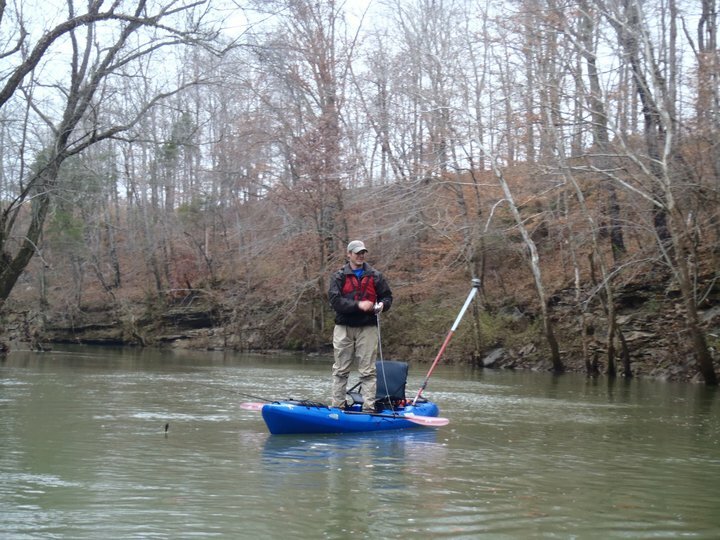 I started in an area about 1/2 mile downstream from the day before in a deep pool. My first weapon of choice was a Lucky Craft 75 SP jerkbait in an MS aurora brown color. 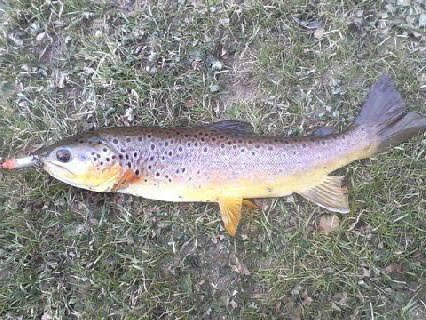 On my fourth cast this 14 inch brown crushed the bait. After getting a couple follows and landing about a 12" fish I switched to an in-line spinner as I fished through a faster section of creek. I went biteless and didn't see a fish for about 15 minutes, so I decided to switch to "old faithful" this time of the year. I tied on a 2 3/4" Rapala husky jerk in the silver with black back color. 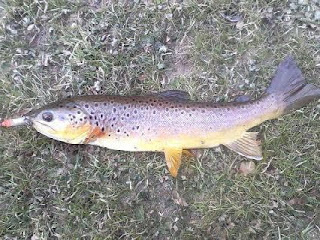 On my first cast I landed a chunky 14" brown trout and 2 casts later I hooked into this solid trout. Shortly after I landed my best trout of the day - a hair under 17". Unfortunately, he slipped my grasp while trying to get my camera/phone out of my waders. 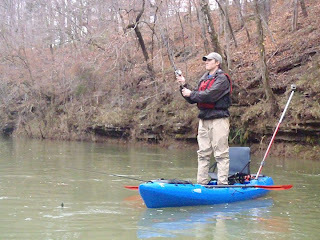 I kept fishing and found 2 really consistent holding patterns for the trout and was landing solid 12"-15" fish regularly. The best part was that I could see most of the strikes, including one fish that I saw come out from under a rock, crush the bait, and head straight for the air. I landed a bunch of beautiful brown trout and lost count somewhere past 15. I lost what looked to be a 17"+ rainbow, but thankfully a few casts later I landed this gorgeous brownie. Finally, I decided to call it a day fishing the trophy trout section. 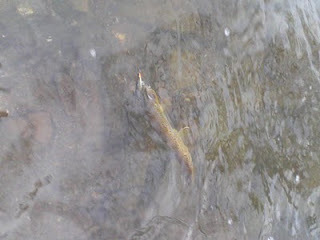 I caught somewhere around 20 trout, had probably another 15 follows, and spotted another 15+ smaller trout. After that great day, I decided to head to a different stretch of stream in search of dinner. After about 5 minutes at one of my favorite winter holes I landed a chunky 14" rainbow, threw him on a stringer, and hit the road. Sauteed in butter and garlic, he made for a tasty Christmas dinner! Tight lines! I arrived at my childhood home in central PA to an empty nest. My parents were traveling; visiting my sister and her family in Wyoming - a trip I was unable to make due to other obligations. 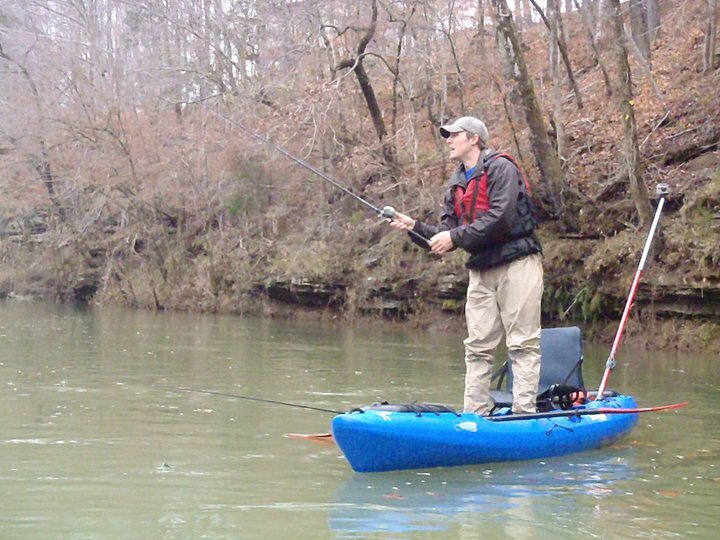 Knowing that they wouldn't get home until late Christmas day, it meant one thing - time to hit the local trout streams. I stepped outside to find a cold breeze and 26 degree temperatures. Immediately, I turned around, went back inside, and got another fleece to wear. I hit the road and after getting squared away with a new license, I met up with my good friend Levi and his father Jim. We decided to hit a stretch of Penns Creek that we all grew up fishing - one that is extremely productive this time of year. It is a native stream, with trophy trout regulations and therefore a healthy population of big brown trout. This time of year we like to throw big jerkbaits (3"-4") to lure the trout from their winter hiding spots. 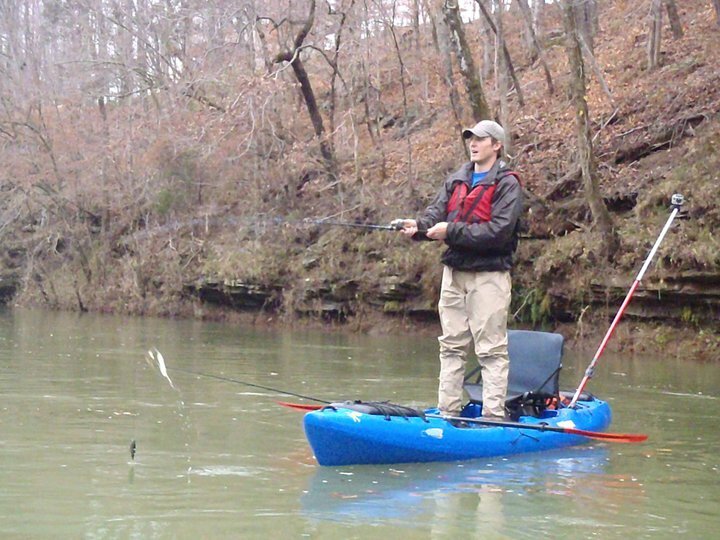 Color, retrieve speed, and size may vary from trip to trip depending on conditions, so it is important to let the trout dictate what they want. I decided to start with a 3 5/8" Yo Zuri Twitch n' Minnow in a gold color. Armed with my ultra-light combo, I waded into the stream and within about 10 minutes I had my first bite. 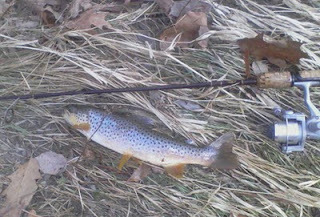 After a nice fight, I landed a 13"-14" brown trout, which would be about average for the day. The key seemed to be a retrieve with long pauses after each twitch/jerk of the bait. It was at this point I realized I forgot my camera and was relegated to camera pics for the day. A few minutes later Levi landed another brownie - about the same size. His hit a Rapala Husky Jerk. 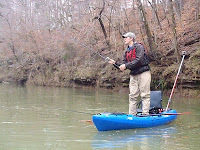 We continued fishing and quickly realized the fish were being lazier than usual in the cold water. We were getting a lot of follows without strikes and fish were mainly holding in very particular areas. We fished for about 45 minutes more. I got to a new pool and on about the 3rd cast I saw a fish follow my bait from mid-stream and finally strike near the bank. 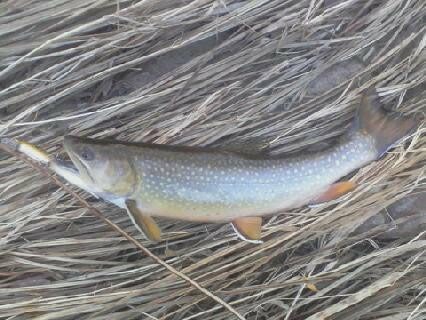 After a short fight I landed a beautiful winter brook trout. Brookies are very rare in Penns Creek, so I was especially happy to have caught this 12"+ fish. Shortly after, Levi lost a nice brown trout near the bank. We then decided to drive to another stretch of stream that we thought would be productive given the conditions. 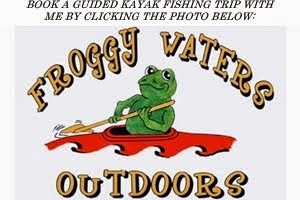 The new area looked perfect and sure enough, on my first cast, I landed a healthy 12"-13" brown trout. 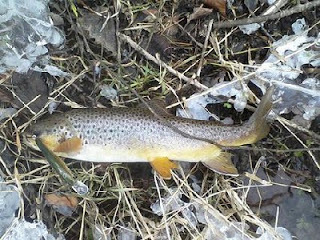 Over the next hour and half I landed 3 more brown trout around 13"-14" and 1 around 10". I also had 5-6 more fish follow to the bank without striking. I found out that Levi and Jim, who had walked down-stream, landed a few fish too. They had to get going, so we drove back to their place to grab my car. Originally I was going to head home, but after a moment of debate I decided to hit the stream for about an hour more. 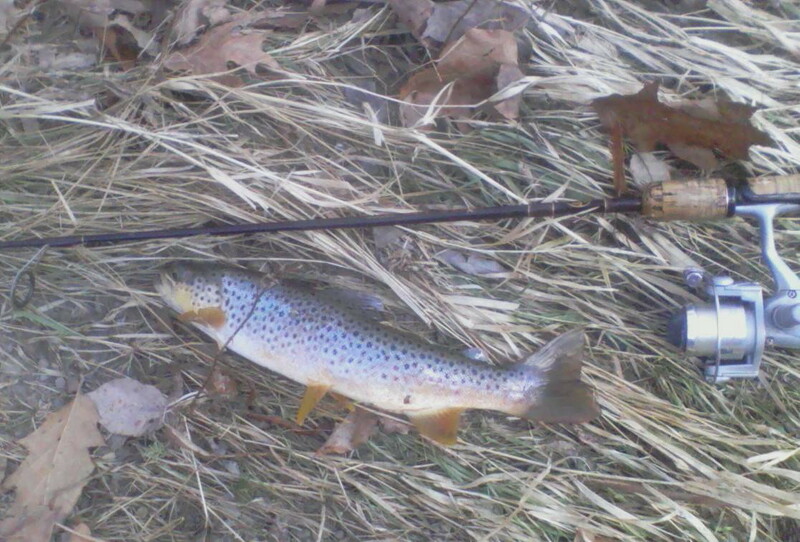 I went back to the same area and despite my best efforts only landed one more fish - another 12"-13" brown trout. I did lose a 15"-16" fish at the bank and had another 4-5 follows. 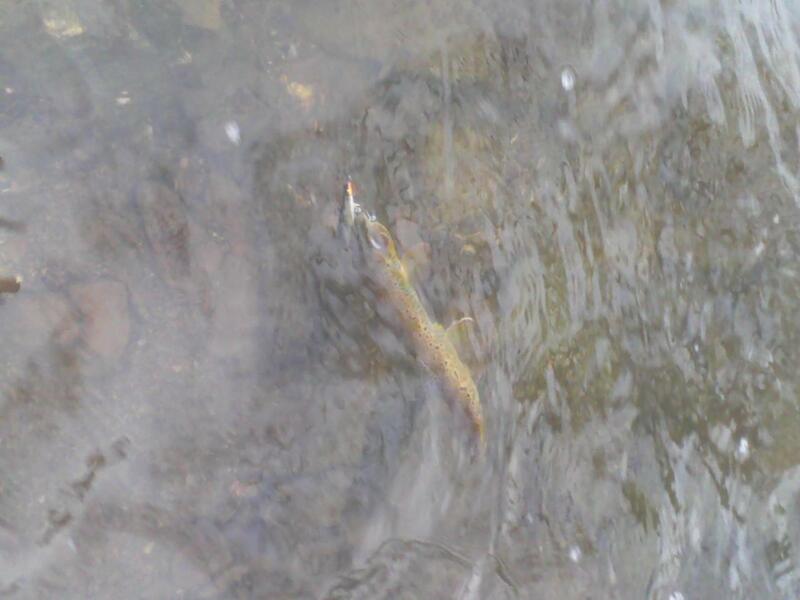 Overall, it was a great day landing 8 trout myself and seeing many more. Plus, fishing the beautiful, clear December water in Penns Creek is a treat in itself, especially when I can share it with friends. Believe it or not, I will be on the water tomorrow morning in hopes of catching Christmas dinner. Tight lines and Merry Christmas! The end of the semester kept me incredibly busy and, hence, off the water. Then the weather foiled my fishing plans over the past week. But finally, Friday was looking decent so Mary May convinced me to load up the gear and take her fishing. Although it was tough to get out of my warm cozy bed (even my dog Brewer didn't seem to want to get up), I was excited to hit the lake. We bundled up and headed south. Mary May had never been crappie fishing before and I knew the minnow fishing experience would be fun for her (and I). So, after a quick stop at the Wilsonville General Store we pulled up to the Seaforth launch and were on the water shortly after - around 1:40 PM. To make things even more interesting, the depth finder was still rigged for my old kayak, so she got to learn to read the fish finder for the day. We paddled out toward the HWY 64 bridge. There were 3 boats in that vicinity already and we decided to stop about a hundred yards away in an area I thought would be pretty good based on location of the river channel, depth, and a hump on the lake floor. Additionally, the wind was blowing under the bridge and it allowed for a nice drift down the old river channel with some subtle paddle adjustments. Mary May was ready to drop some minnows! We got set up and dropped our minnows. No sooner did my minnow get set than I saw my rod tip bobbing and I set the hook into a nice crappie that measured 11.75". I thought I had the first fish of the day, but just as I landed my fish I turned around to see Mary May reeling one in as well. Her crappie, the first she ever caught, was 13.6" and a really chunky fish. Both fish went on the stringer and we dropped our baits again. Within minutes we caught two more nice fish - both right around 11". We tossed them back and repeated the process. The bite was steady for us both for quite some time. Around 3:50 PM the wind really started to die down, which seems to never happen to me on Jordan. The bite slowed a little, so we moved up close to the bridge pilings and were catching fish very regularly, but most were just under 10". Finally, we started getting into some nicer fish and boated quite a few that were right at or over 11". Around 5:10 PM we headed back to the launch, packed up, and hit the road. It got cold awfully quick as the sun set. We caught somewhere between 30-35 crappie with probably 10-15 keepers. We kept 4 that I breaded and baked Saturday night....yum yum! Fish were all caught on minnows in 12-30 feet of water, but the best bite was around 20-25 feet deep. 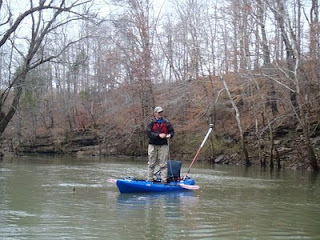 Again, I was impressed with the Coosa - it had plenty of room and performed well in the open water. Merry Christmas and, as always, tight lines! Good looking girl, good looking fish, good looking boats! A few months ago, professional kayak fisherman Drew Gregory showed up at one of our Carolina Yakfish tournaments with a prototype of a boat he was designing for Jackson Kayak. I knew about Drew's reputation and we had talked briefly online, but I had not met him prior and was anxious to do so and to see his new boat. The boat had a very open design with very few features and a basic front deck. At that time, the name hadn't even been finalized, but he was fairly certain it would be named the Coosa - after a river in Alabama known for it's aggressive spotted bass. It's major selling point was that it was designed with river fishermen in mind, but is great for any setting...and to top it off - the boat was made to be stable enough to stand and fish from. The original prototype looked nothing like the finished version I got to see this past weekend, but I was able to take that prototype for a brief paddle and from then on I was hooked on getting a boat that I could stand up and fish from. A few months later I teetered on buying a Native Ultimate 12 - actually from Drew. But, he convinced me otherwise and mentioned to me that if I was interested and was willing to put in some effort, there may be a place for me with Jackson. Needless to say, I was excited to hear this and have been trying extra hard to be a positive ambassador for the sport of kayak fishing in as many ways as possible ever since. My hard work paid off and thanks to Great Outdoor Provision Company (who are my sponsor for Jackson) and Jackson, I can now call myself a part of the Jackson Kayak Fishing Team. A family friendly brand made entirely in the USA! This past week we met in Sparta, TN to tour the factory, get our boats, make some customizations, give feedback, meet the Jackson staff, and spend some time on the water together. I left Durham around 1 PM and headed west on I-40. I barely made a turn and ended up in Cookeville, TN around 7:30 PM local time. There I met up with Drew G, who would be my roommate for the weekend, grabbed some food, and soon met some of the other guys - Ben Roussel from Baton Rogue, LA and Tim & Adam Parker from Georgia. We spent the night watching the Eagles-Texans game as well as telling fish tales and watching a number of Drew's recent videos. The next morning we got up early and headed for breakfast at the hotel. 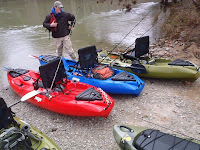 There I met Joe Pulliam (founder of Dagger Kayaks and current 'Head Coach' at Jackson) as well as some other team members. 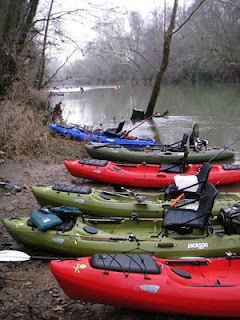 From there we packed up and headed for Sparta, where the Jackson Kayak factory is located. A few more team members met us there. After a bit of chatting, it was obvious that this was a diverse and talented group. 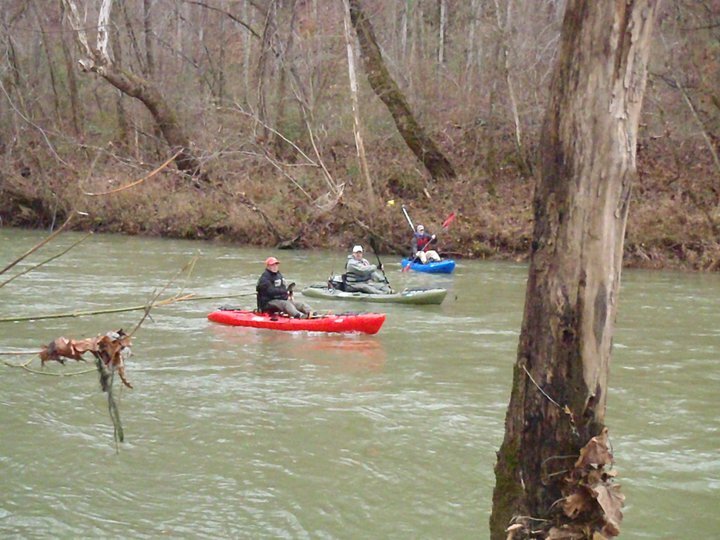 It included anglers ranging from age 15 to early-50's, coming from all across the southeast (and beyond), and specializing in just about every type of fishing you could imagine. The factory is located in an old Wrangler Jeans warehouse and really epitomizes a small, family friendly business. We were treated like close friends from the moment we stepped in the door. Inside were some offices and another door that opened into a huge warehouse stacked full of kayaks. Along the main aisle we saw about 15 Coosa's...and they had our names on them! Some colors - such as the camo, red and black mix, and blue were a hit. Others - like the white & red mix and white & orange mix - were up for debate. Looking around, I noticed that we were all smiling like idiots - a trend that carried on through the weekend. I was in love with my Coosa - a Duke Blue version that really looked sharp. Excited to get our shiny new boats! We spent the next hour or so going over some basics of the boat, making a few minor changes, and visiting with each other. 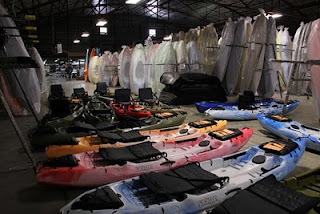 Then we got a factory tour and saw how kayaks are made from scratch. It is odd to think that their boats, made from some of the toughest plastic polymers you can get, start as a colored, sand-like material. Then they get molded and pieced together by hand. Each boat is assembled by one worker rather than assembly line style. Mine was built by "Uncle Steve" - so if you happen to read this Uncle Steve, I want to say thank you! 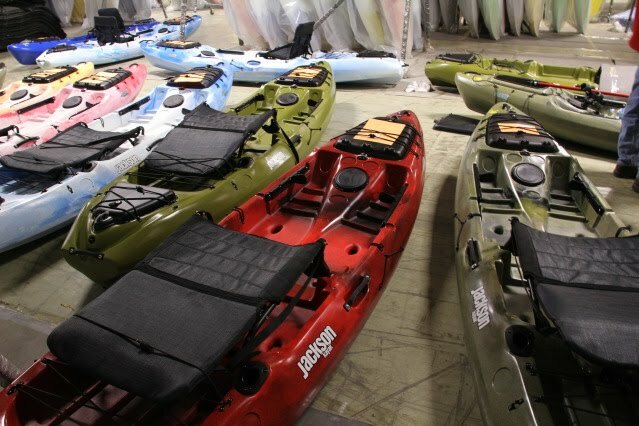 I have never toured another kayak factory, but I can see why Jackson has such an awesome reputation. They are extremely careful and detail driven throughout the entire process and have some great people and great minds at work there. After getting some food we made a few more changes to our boats and began to load them onto/into our vehicles. For most, it was as easy as throwing a yak or two into the back of a pickup. 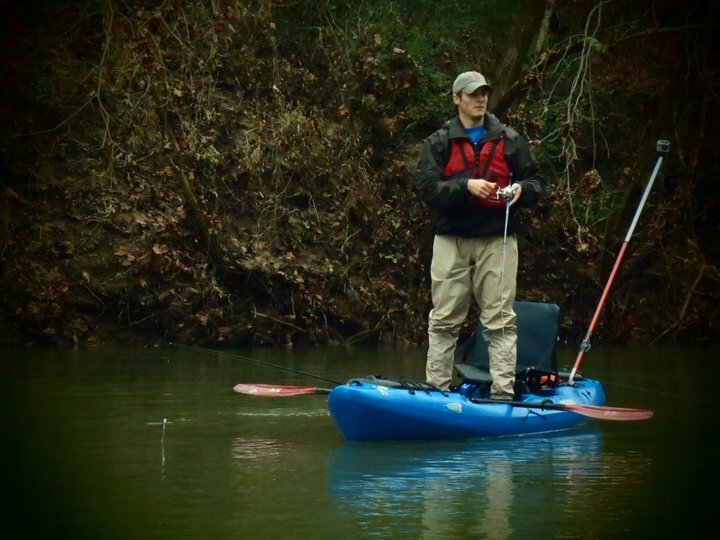 For me, the Coosa fit great in my Thule J-cradles. For others like Ben R and Ben Adrien, they had to fit 3 boats on top of their vehicles (with Ben Adrien's being a smaller coupe). From there we headed south to the home of owner/founder Eric Jackson and his family. Along the way we stopped at Rock Island State Park to check out the sweet waterfalls. Not so coincidentally, they were less than 2 miles from EJ's home. I had spent about 2 hours looking at YouTube videos of EJ and the rest of the Jackson whitewater team before heading to TN. All I can say is WOW you have gotta take a look (*not an official Jackson Promo Video)! We pulled up and he met us outside. He, much like Drew G, is a high energy guy whose gears are always turning. He talked about how Jackson was founded, where he sees the company going, and what he expects of us. 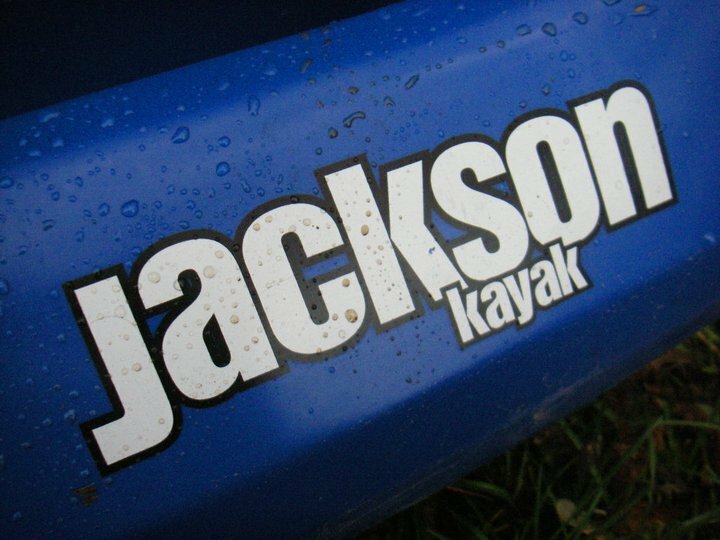 Jackson is the leader, by far, in whitewater boating and was looking to expand - so their partnership with Drew G was a great fit. Then we just sat, ate some tasty food he and his wife grilled for us, and talked about all sorts of things. The best part was that despite being an insanely talented whitewater kayaker, he grew up in Florida and loves to fish too! We all headed out fairly early (we were pretty exhausted). Some guys headed home and others, including myself, headed back to the hotel and found a place to float the next day - a stretch of a local river known for holding muskies. 7:22 AM local time, 41 degrees, wind chill of 35 degrees - perfect morning to fish!? We got up the next day, met for breakfast around 6:30 AM, and headed for the river. We set up a shuttle and after some prep work we were on the water. Now comes the only down side to my entire trip. I launched the boat and was excited to feel that it handled much like my 10' sit in kayak. In fact, the only real difference was that I was sitting up much higher (the Coosa has multiple seat positions) and the Coosa is 1.5 feet longer. I paddled around a little and then went to grab a rod and make a cast. As I took my rod out of the rod stager and unstrapped it from a bungee I momentarily looked away. As I did, the rod slipped from my grasp and into the water. Numerous attempts at a rescue proved fruitless - as the water was higher than normal and not clear enough to see bottom. I was pretty bummed, but thankfully the rest of my trip was so great that I soon forgot about the entire situation. 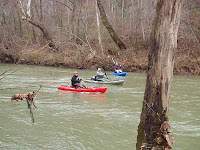 Drew G, Bruiser, and I paddled down river to catch up with the rest of the group. I wanted to get some footage of everyone since Drew G had put his GoPro Hero HD video camera in my kayak for the day (he was filming a promo video with another camera). Although nothing too spectacular happened, I am interested to see some of the footage and am pretty sure one of those little gadgets will be riding with me by spring time (at the latest). We floated and fished - mainly seated except for Drew G and Adam (who was the lightest of the group by far). Eventually, I decided I wanted to try and stand to fish. I had never stood in a kayak before and was really anxious to try. We came to a slow section and I, nervously, gave it a shot. I stood up for about 5 seconds before the shaking in my legs caused me to return to my seat. It was a combo of my nerves and getting used to the stability of the boat, but at that moment I thought I would never be able to stand and fish from the Coosa. But after floating for a little while longer I decided to give it another shot. This time I stood for about a minute and was getting the hang of just standing. Then I picked up a rod and started casting away. Although a little wobbly at times, I was getting the hang of it pretty quickly. 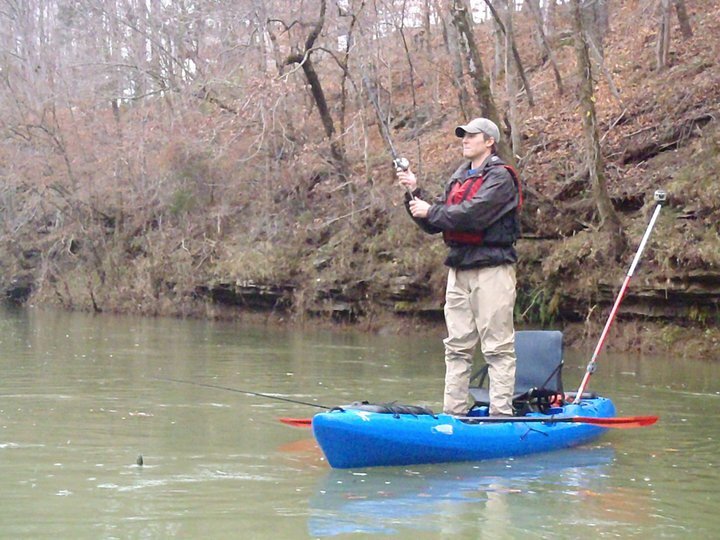 In fact, I think casting actually helped me adjust faster to standing in the boat. Now, I wasn't hopping around the boat like Drew G tends to do, but I was slowly getting there. Searching for that elusive bite! We stopped for a break and found that no-one had caught a fish. Ben R got a good bite, but the fish got off, I had a follow (just saw a flash at the boat), and that was about it. We were getting tired in the cold weather and we continued down river fishing rather casually. This stretch was a little slower, so I made it a point to stand and fish as much as I could. Over the final few miles of the float I rarely sat down. 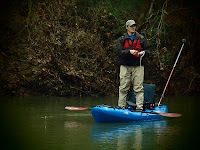 I easily fished and paddled from the standing position and quickly fell in love with that feature. What a great day and weekend! I will post a more detailed review of the boat in a day or two. Until then, tight lines!